Main Features:- DEEP CLEANING LEAVES NO PLACE FOR DIRT: Two main cleaning brushes ( one to loosen dirt and the other to pick it up ) extract dirts hard to clean; the 1000pa powerful suction absorbs the res..
- DEEP CLEANING LEAVES NO PLACE FOR DIRT: Two main cleaning brushes ( one to loosen dirt and the other to pick it up ) extract dirts hard to clean; the 1000pa powerful suction absorbs the rest. Together they can efficiently collect dirt, dust, debris and hair from your floors. Plus, equipped with a 600ml large capacity dustbin and 600ml water tank, it provides optional mopping and drying stages to remove even the most stubborn dirt and thus ensure a thorough clean for your home. - TOTAL CONTROL IN YOUR HANDS and WITH YOUR VOICE: Compatible with Amazon Alexa, the robot will response quickly to your voice commands, simply speak to start, stop your robot; APP control ensure you can operate, schedule and monitor your robot vacuum anytime, from anywhere; included controller provides full-scale accurate remote control. - SAFE and VERSATILE: Equipped with advanced anti-collision sensors, this robot can detect objects in its path and navigate around them to achieve uninterrupted cleaning; while included cutting-edge anti-drop sensors: ensure the robot can clean up around stairs safely without falling. Moreover, being able to cross barrier up to 15mm and climb for 30 degrees max, Alfawise robot can effectively cleaning different types of hard floors and carpets. - 3 TARGETED CLEANING MODES and ULTRA-LONG WORKING TIME: 3 optional cleaning modes meet different cleaning requirements to achieve maximum efficiency - - zigzag mode, edge mode and spot cleaning. Plus, powered by powerful 2600mAh battery, Alfawise robot can work up to 100-120 Mins on a single charge over all. 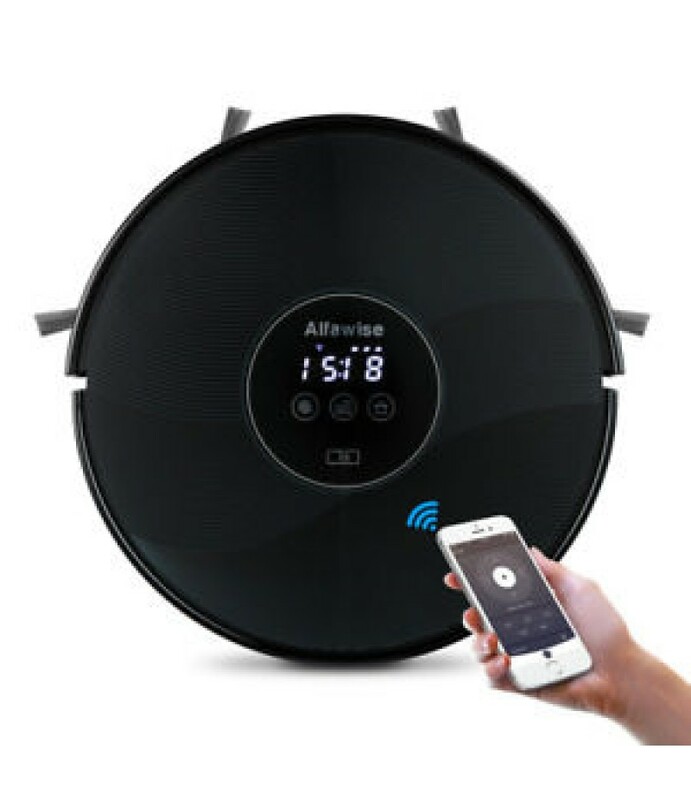 Moreover, Alfawise automatically returns to its home base to recharge itself after it has finished cleaning. Always ready to clean! - LOOKS CLASSY and WORKS QUITELY: Tempered glass top cover, refined finish and large LED display make it a classy household appliances. All parts are easy to mount and disassemble, cleaning this robot won't be a trouble. Besides, it works quietly with noise level less than 60db, you'll never feel bothered.